Apple Digital AV (HDMI) Adapter for iPhone and iPad – Worth the $39 it Costs? 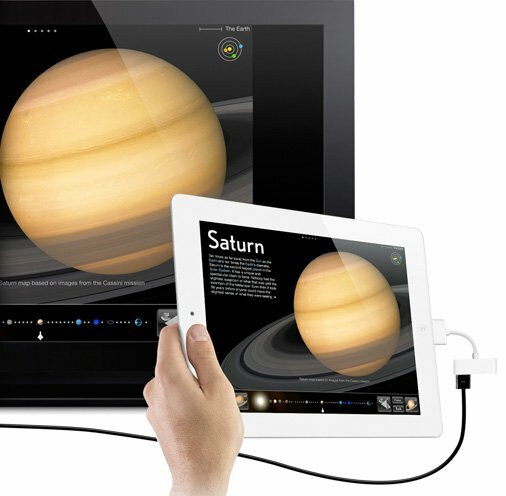 Apple’s new Digital AV Adapter was released alongside the iPad 2, to allow iOS-powered devices to output HD video as well as digital audio to HDTVs and HDMI-compatible displays. The adapter allows users to output slides, movies, photos, and everything else that fills the device’s screen, with a the help of an HDMI cable. Is the new cable worth the expense? 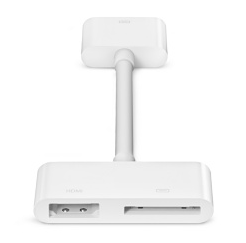 The adapter is small, and offers on one side a traditional 30-pin dock connector, and on the other side, a dual HDMI and dock connector port. To test the cable, we used an iPad 2, and fired up AirVideo, to play TV shows recorded in 720p (24 frames per second). When the video is not displayed in full screen mode, the iPad 2 simply mirrors the contents of its screen, and the resolution is limited to the native iPad screen resolution (1024×768). Once the video was played in full-screen mode, the iPad automatically adjusted the video size to 720p. The output was excellent, as the video filled up the whole screen, and the quality of the picture was great (check out the video below). We also tested other iOS-powered devices, and the outcome was excellent as well. According to Apple, the adapter supports video output up to a resolution of 1080p (1920×1080 pixels), but as far as we can tell, iOS devices are not able to output video at a higher resolution than 720p (1280×720 pixels). Note that this is not a major issue, as 720p is already much better than what the original iPad VGA cable offered, and the limitation seems to be on the devices, not the cable itself. Hopefully, later releases of iOS will allow 1080p output, at least for devices powered by the Apple A5, such as the iPad 2. The mirroring capability offered by the adapter is also a great feature, as it allows users to do presentations and demos directly from their device, via a large screen, or an external projector. However, the feature requires a fast processor, and only the iPad 2 is able to offer the feature at this stage. Overall, the Digital AV Adapter is a great way to allow iPad, iPhone and iPod touch users to output video to HDMI-compatible devices. While the adapter does not come cheap, as it costs $39, its price is at least three times lower than more dedicated solutions such as the second generation Apple TV, and will allow iOS devices owners to do a lot more than ‘just’ watching movies.